My dear friend and wonderful weaver, Deanna Pilling, unveiled her Forest Floor plaid at today’s Guild meeting (Sunshine Coast Spinners and Weavers). The narrow pink and orange stripes are of yarn I dyed with mushrooms; the lighter middle stripe came from blackberry leaves and berries and was dyed by another weaver. 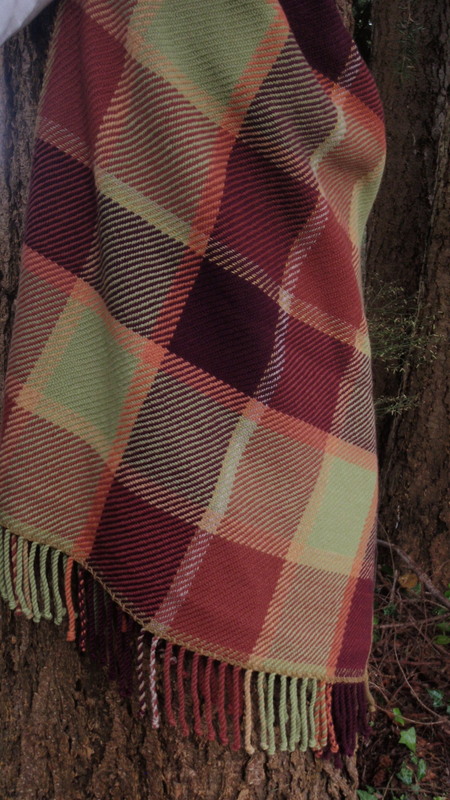 Deanna spent a lot of time deciding on the rest of the colours that make up this plaid; together they represent our rainforest with the rich hues of cedar, arbutus and soft green moss. WOW!!! I love that forest floor blanket. I am new to the whole world of spinning, weaving and dying with mushrooms. I have collected a nice bunch of shelf fungus, I believe I have five types to experiment with from northern PA. I cant wait to get started. Your postings are inspiring me to go! Once I read more through my books before I ruin something that is! 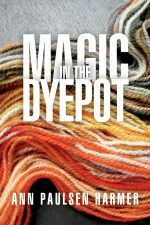 Good luck with your dyeing experiments – there’s not a lot that can go wrong as long as you handle the fibre with care. It’s great to know there’s another mushroom dyer out there! I want to do something with the bracket fungus I have collected. I am not sure where to start. Just chop them up, one species at a time, through in a pot and start simmering?